If the day that you will meet your newest addition(s) is drawing near packing your hospital bag is probably at the top of your to-do list! The most common thing I hear from mothers is that they feel they overpacked. 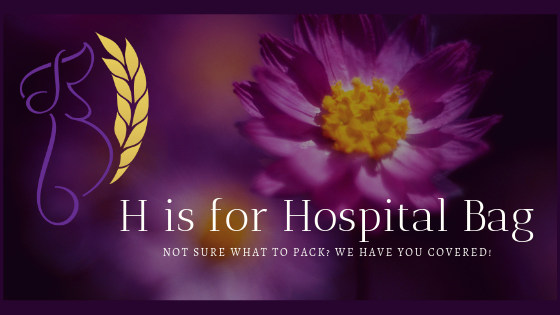 When you pack your hospital bag keep in mind that during labour the hospital will have most of your needs covered and once your baby is born women typically spend 24 hours in the hospital after a vaginal birth and 48 hours after a cesarean. You likely won’t be in the hospital for very long and so you really won’t need as much as you think! I recommend that you pack separate bags for you, your partner and the baby. In addition, you may want to back yourself a birth bag and a postpartum bag. That way you have less stuff to pack into the hospital when you are in labour. The other benefit to this is that if you are having your baby at a hospital where you transfer to a different unit or room after the birth you won’t have to carry as much stuff during the room transfer. I have been at many a birth where we had more stuff to carry than hands to carry it. Birth Plan: Be sure to keep a copy of your birth plan either in your purse or your birth bag. Your nurse will usually go over it with you and then add it to the binder of information they keep on you during your stay. You may also want to bring a list of all the medications and supplements you are currently on so that you don’t have to try to remember while labouring. Food: Make sure you pack food for your support people. Depending on what hospital you give birth at there may not be food available 24/7 other a vending machine. You likely won’t want them to leave for food while you are in labour so make sure they have what they need. You may also want some high energy snacks or favourite foods! Clothing: You can wear the hospital gowns while at the hospital or you can pack an outfit to wear while in labour. If you choose to bring something a night gown with a button up front works perfect or you can purchase something designed for labour and birth. For postpartum I recommend packing comfy maternity wear or baggy comfy clothes. Your pre-pregnancy clothes likely won’t fit yet and after all your hard work birthing and then learning to care for your baby you will want to be comfortable. Pack a couple different outfits and some comfy pyjamas. If you plan to breastfeed keep that in mind when picking outfits. You want tops either designed for breastfeeding or tops that are easy to breastfeed in. If you have anyone staying overnight with you they will probably want to pack a fresh outfit as well. Toiletries: You can pick up a small travel size bag of toiletries to save space in your bag. Things like shampoo, conditioner, toothbrush, toothpaste, brush (you can get the foldable travel ones), hair ties, razor, and make-up if you feel like you will want to wear some. A lot of women find the hospital toilet paper to be too scratchy for a postpartum mother so you may want to pack a roll of soft toilet paper. Another item that most women find helpful especially in labour is chapstick. Baby: The hospital will provide diapers, wipes, and receiving blankets for you to use at the hospital. They also have gowns for the baby for while you are at the hospital. You will need an outfit to take your baby home in. I recommend bringing a couple different sizes so you are prepared no matter what size your baby is. Bring a couple outfits so that you are prepared for any possible poop or spit up accidents. You will also need a carseat and a blanket or two to keep baby warm in their carseat (keeping in mind not to put any blankets behind the carseat straps). Comfort Items: If you have items in mind that will bring you comfort in labour and postpartum bring them! Whether it is affirmation posters to put up on the walls, music, electric candles, slippers, crystals, essential oils (you can not diffuse in the hospital but you can put a few drops on a cloth or smell from the bottle), a favourite blanket, etc. Try to keep the number of items within reason, but comfort items are important so don’t feel obligated to leave them behind. Pillow: Hospital pillows are flat and slippery! Bring your own pillow from home! Just put a bright pillowcase on it so that it stands out from the hospital pillows. Your support person may also want to consider bringing their own pillow for the postpartum stay. Electronics: Pack yours and your partners phones and chargers, a camera if you don’t want to take pictures with your phone, and a laptop if you are wanting to watch some Netflix postpartum. I hope you find this list helpful as you plan for this very exciting adventure! Where there other items that you packed and found helpful during your stay or that you wish you had brought? I would love to hear about them!